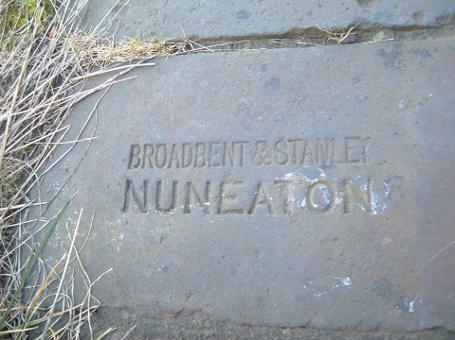 The Broadbent's of Leicester were a major reason for Stanley Brother's involvement in Nuneaton. They were, along with Reginald's brother Jacob, the family who invested in a small brickyard and turned it into a major employer for the town. On this page i'll introduce you to the Broadbent family and even some of them made Nuneaton their home. You can also read about Broadbent Limited a builders merchant based in Leicester, they were also in business well over 100 years. Click here. Benjamin Broadbent Snr (1813-1862) was a builder, stonemason and architect by trade. Although he had passed away before the takeover in Nuneaton, his hard work building the family business deserved a mention. He and his wife Jane married in 1838, living and working in Millstone Lane (below left), where he started his own firm called Broadbent Ltd in 1840, employing twenty four men by 1851. Possibly his most famous work was the King Richard III plaque that was erected on the Bow Bridge in 1856. It marked the remains of the fallen King, which as we now know wasn't in the right place. (1) The bridge was eventually replaced and the sign moved to its current location, where it remains a tourist attraction close to the new bridge today. That same year Benjamin was hit with the news his wife had passed away aged just forty four. Leaving behind four children Benjamin Jnr (17), Jane (15), Thomas (13) and Joshua Wesley (7). Broadbent Co' was booming and his heart must have been hurting but he had to carrying on. Benjamin Jnr was taking a more active role in the firm and became his fathers right hand man. Within just a few months Benjamin Snr re-married a young lady called Mary Geary (not due to financial issues, as most people needed to re marry because couldn't afford to look after a family in that era on their own.) she was just eighteen and he was forty three. Nevertheless, business was going from strength to strength and had amassed a small fortune. 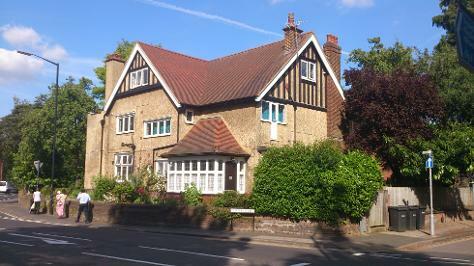 He bought a pocket of land off the Humberstone Road/Belgrave Lane building a magnificent home called Victoria House. It was described in the deeds as a Mansion House with stables, coach house, wineries, orchard, houses, conservatories and outbuildings. His bulging family now with four more children, moved into their new home in early 1860. Unfortunately Benjamin didn't get long in his new home, in 1862 he passed away after a short illness. The family moved out virtually straight away and I'm guessing it wasn't a very happy household for more than one reason. My feelings are that Benjamin Jnr was upset about his fathers new wife (being just a couple of years older than him) the family split up, Mary going her separate way and was later to re-marry. Above left - The old asylum as it now stands (2016) its seems to be used for housing and other parts are being knocked down. Above centre - the asylum at the turn of the century. Above right - A photo of the auction catalogue from 1862. I managed to find a catalogue from the auction of Benjamin Broadbent's possessions. (Thanks to the Leicester County Records Office) It had every item listed including the most mundane things like a dog house to the valuable, a fine-toned finger organ. above is a photo of that flyer for the auction in October 1862 by John Holland. Looks like Benjamin was interested in riding and shooting, and there were bookshelf's full of literature. The house and thirty acres of ground itself was bought for £8000 by Leicestershire Council. They intended to use the material, but after further inspection there was dry rot, so they sold them in 1867. (2) The grounds were then made into the Leicester Towers Hospital Mental Asylum. Benjamin Broadbent Snr was interred at Welford Road Cemetery joining his first wife in the family vaults. As you can see Mr Broadbents story was worth putting in as a starting base for how the family gained its wealth and helping his son to expand the families empire further afield. Benjamin Broadbent Jnr (1839-1887) was Benjamin's eldest son. He worked with his father as a builders hand, learning the trade from his experienced father and no doubt how to run the family business. In 1861 he married a young lady called Susan Jenkin Stanley (Reginald's sister) and they bought a house in Regent Street opposite Leicester's Great Central Train Station and settled into married life. Soon tragedy hit the family, his father passed away in 1862, and Benjamin was put in charge of running the family business aged just twenty three. His focus was not just on the business, at home his family was growing. The pair had their first child Stanley in 1864, followed closely by Reginald (1866), and then Francis Wesley (1868). Not happy with his fathers successful company, Benjamin wanted to branch out. He spoke with Jacob Stanley, his wife's brother, they were the same age and both ambitious. An advert appeared in the local papers for a brickyard in Nuneaton. The pair decided it would be great addition to the timber merchant business and so bought the established brickyard on Croft Road and called it Broadbent & Stanley. The partnership was'nt going to last long as Benjamin fell ill and stepped back from the running of the Nuneaton brickyard. Reginald was back from America and wanted to invest in the business with his brother, so Benjamin stepped away leaving Jacob and Reginald to carry on the expansion of Nuneaton in 1871. The family grew by one in 1873 with the addition of Allan, also moving from what was a modest home close to the city centre to West Hill House, 97 Hinckley Road (below) a fine looking Victorian home fitting for a successful businessman. Broadbent Limited continued in Leicester and Benjamin's eldest son Stanley was his right hand man, primed to take over from his father due to his continued ill health. When his long and pained illness finally took his earthly body, Susan left her son to look after the company, eventually leaving him in sole charge a number of years later. Right is a photo from 2013 of 97 Hinckley Road, you can sort of see how nice this place would have been in the 1880's minus the shop. Susan, the eldest of Jacob Stanley's six children moved to Leicester with her Father as he became the Minister of Bishop Street Methodist Church very close to the city centre. The Broadbent name had been involved in the Church since its erection and its easy to see how they ended up together within this tight knit religious community. The Stanley Family home was close by at No8 The Crescent (see below left). Leicester was to become Susan's home for the next 30 odd years. A photo of the Crescent (year unknown) hanging pride of place in the reception area of The Crescent, thanks to the caretaker of the property. The Crescent as it is now in 2015 used as business offices. She married Benjamin Broadbent aged 25 and had four children. Stanley, Allen, Reginald and Francis Wesley. Unfortunately Susan aged 41 was left widowed, luckily in a comfortable position by her late husband. Deciding to leave her son Stanley (24)(read below) to run the company business, she carried on bringing up the other boys until they flew the nest. Susan was known as a strong character with great mental ability, making herself active in the community, also keeping the traditions of her Methodist parentage. Mrs Broadbent kept a diary, unknown to many of her close family and friends. It was a pilgrims progress, and of God's mysterious leading of one of His faithful servants. She was always using her favourite book, the Daily Light, a reference to the bible broken down into daily snippets. Also publishing quite a few thoughtful volumes questioning the borderland between Religion and Science. 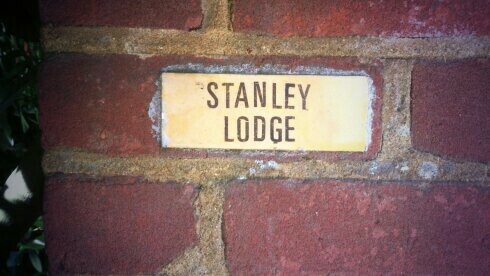 At some point during the early 20th century, she moved to London and Muswell Hill due to illness, before settling in St Alban's with her son Rex at the aptly named Stanley lodge. (below) Susan passed away on the 6th January 1924, aged 87, leaving behind her memoir's, published in 1925. It's an interesting look back over her years, including a detailed family tree, which I've found really useful in piecing together the Stanley family tree. Reginald Broadbent (1866-1928) his name has come up many times during my research into Reginald Stanley and is one of the best links between the Broadbent's and the Stanley's. Reginald Broadbent was the second eldest son of Benjamin and Susan and along with his younger brother Francis went to boarding school in Brighton (right), both were being primed to be doctors. Reginald and Francis trotted off to the University of Edinburgh and spent a good 5/6 years studying. On 1st September 1888, Reginald was given the title M.B (Bachelor of Medicine) Master Surgeon and headed off back to Leicester to be with his mother. Dr Broadbent practiced as a doctor in Leicester and was dedicated to his occupation, so much so he didn't find a lady till quite late in life (46 years old). He visited Nuneaton and Reginald quite a bit and was always on hand to help out with church duties. He came to open the Primitive Methodist Church on Queens Road. You can read about the opening by clicking here. On these visits to the Stanley household he came across a young lady by the name of Marie (Mary) A Stanley. They must have met on various occasions and after Mr Reginald Stanley (I will refer to as Mr Stanley) was taken ill, he and Marie would be by his side after he moved to Bexhill on Sea. Over the next few years, Reginald Broadbent (also known as Rex) and Marie looked after Mr Stanley, travelling in the first few years between Muswell Hill and Bexhill. They read him books, newspapers and chatted to him about his time in Montana. Mr Stanley had various letters from the Montana Pioneers and Rex would read them and reply on his behalf. 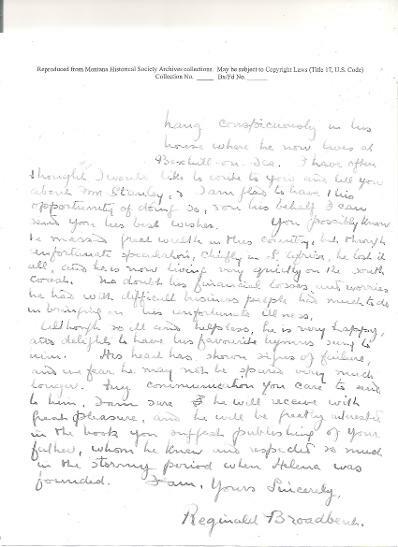 Below is a few of the letters he wrote very close to Mr Stanley's death. These letters were saved by the Montana Historical Society and its thanks to them I have copies for you to see. You will be able to read more of these letter on a new page I will be working on soon. After Mr Stanley's death, they made Bexhill their home on a more permanent basis, living in a house called 'Fort Stanley' on the corner of Park Road. They brought along with them two children David Stanley Broadbent, born 1913 and Annette M S Broadbent 1915, adding a third on the 11th December 1920 called Frances, once they had settled in Bexhill. 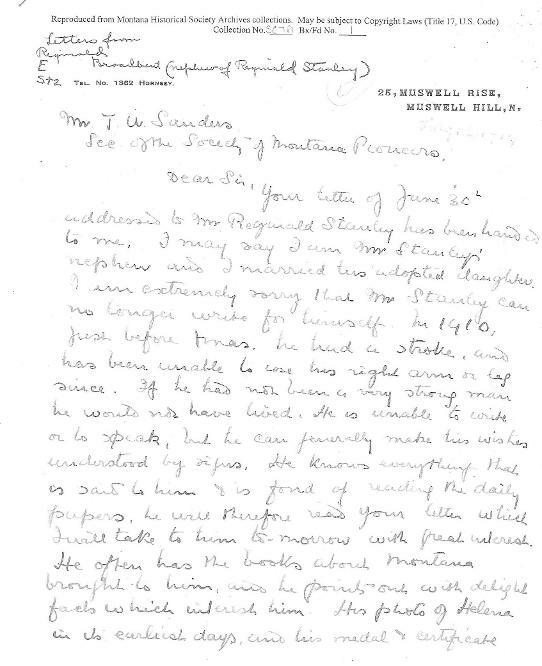 Rex continued to keep in touch with Montana up until the death of James U Sanders (Montana Pioneers Secretary) in 1923 due to a motorcar accident. The letter's would soon end as Rex passed away in 1928. He was visiting his son David at University when he passed away. 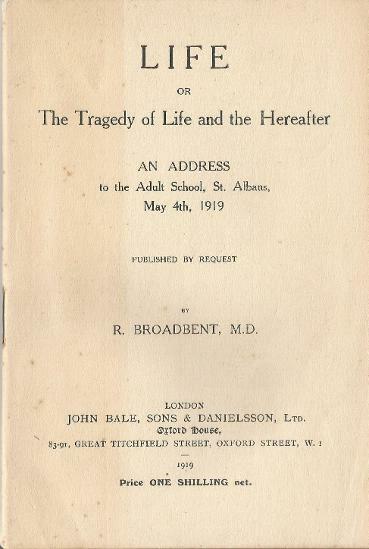 Francis Wesley Broadbent (1868-1918) has got a page dedicated to him on the website. He spent a short time living at Lansdowne Terrace and working in Nuneaton for Reginald as his Ceramic Works Manager and also at Nuneaton Engineering . In my opinion he was primed to be the Managing Director when Reginald stepped down. You can read about Francis in more detail on the link click here. Along with his brother Reginald, Francis was also a qualified surgeon shown above in 1898. Stanley Broadbent (1863-1915) was the eldest of Benjamin and Susan's children. His father lined him up at an early age to become his replacement at Broadbent Ltd, giving him a hands on role. When Benjamin's health suffered he already had a great understanding of the workings and stepped up with great ease. His fathers death meant he became, at first the manager, with his mother as owner, then eventually Susan handed him the reigns. While he was running the family business, he still managed time to find love and in 1894 he married Charlotte Annie Britten, the eldest daughter of Anglican Vicar of Somerby, Leicestershire, Thomas Candy Britten. They went on to have five children, Beatrice, Annie Susan, Gerald who died in 1898 just three weeks old, Muriel Agnes and finally John Reginald Maxwell. Stanley was a very busy man during his lifetime. He was an active Liberal party Councillor in Leicester's Abbey Ward and a leading member of the Chamber of Commerce. 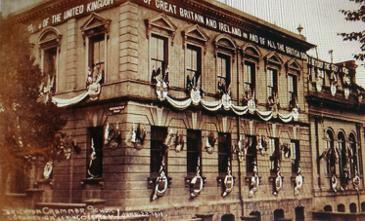 He was also Governor for the provident dispensary in the city. Stanley Broadbents signature from the minute book of Stanley Bros around 1910. Thanks to Warwickshire County Records Office. During his time in charge at Broadbent's, Stanley put his name to at least one patent, which I managed to get my hands on. It was for improvements to Chimney Pots or Top's. He, Alfred Stephens and David Jeavons were business partners in 1905 and designed a pot that had an inner and outer part to allow air or wind to enter through the bottom and up through tapered air passages. His time on the board was short, the minute book for Stanley Bros in 1915 reported that with regret Stanley Broadbent had sadly passed away (below left). After feeling ill for a short while, Stanley had decided to visit Skegness and get some fresh, sea air. He stopped at the Vine Hotel (below right), unfortunately he caught an east coast chill, which turned into pneumonia causing his untimely death.